The University Singers were so excited about touring Venice! The day we went to Murano was only a sneak-peak at the wonders that this city holds. We had a glorious boat ride to the docks of San Marco island. Our guide pointed out sites that included a cathedral designed by Andrea Palladio himself! After getting off the boat we walked a short distance to our first stop, the Doge’s Palace. On the way to the palace we saw canals with gondoliers rowing the famous gondolas. We arrived at the Doge’s Palace, after being careful to avoid the slick, marble steps, and prepared to take our tour of the government center and home of the ruler of the Venetian Republic. We walked through Moroccan inspired courtyards, ascended marble staircases, and wandered through palace chambers that had ceilings embellished with 24 carat gold-leaf. The team was awestruck at the beauty of the palace, but also at the uniqueness of a representative republic that carried similarities to our own United States. The Singers also walked over the infamous Bridge of Sighs, which was named so by prisoners who crossed from the courts into the prison; the bridge giving them their last glimpse of sunlight, before they entered their dark cells. At the conclusion of the palace tour, several of the team opted to see St. Mark’s Cathedral. The byzantine inspired church is made of marble columns that were stolen by the Venetians from Byzantium during the fourth crusade. The ceiling was of shimmering gold and had biblical icons throughout. The Venetians also, reportedly, stole the body of St. Mark the apostle when they stormed the gates of Byzantium. With the tours complete, the Singers were allowed some time to wander through the streets of Venice. 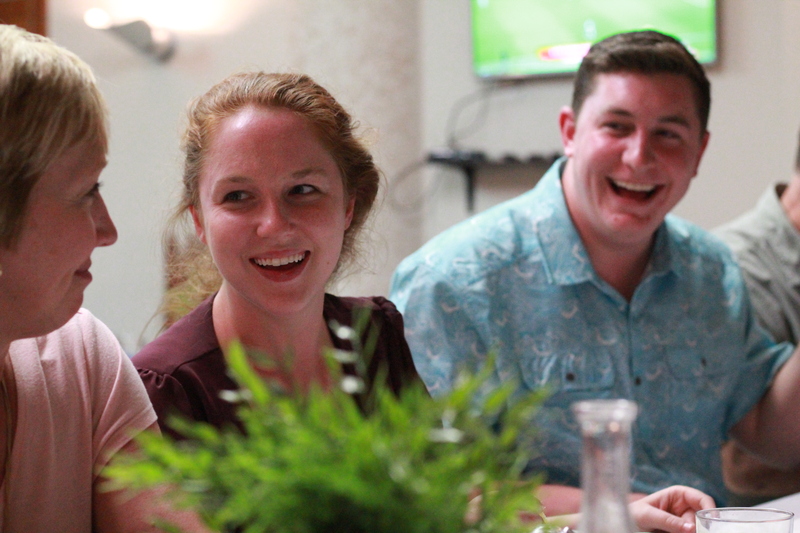 We shopped, dined, and laughed. We also chased many pigeons away… they are very annoying! They also steal food. Allen was eating a sandwich and walking and ate about half when a pigeon flew by and stole the rest right out of his hand! 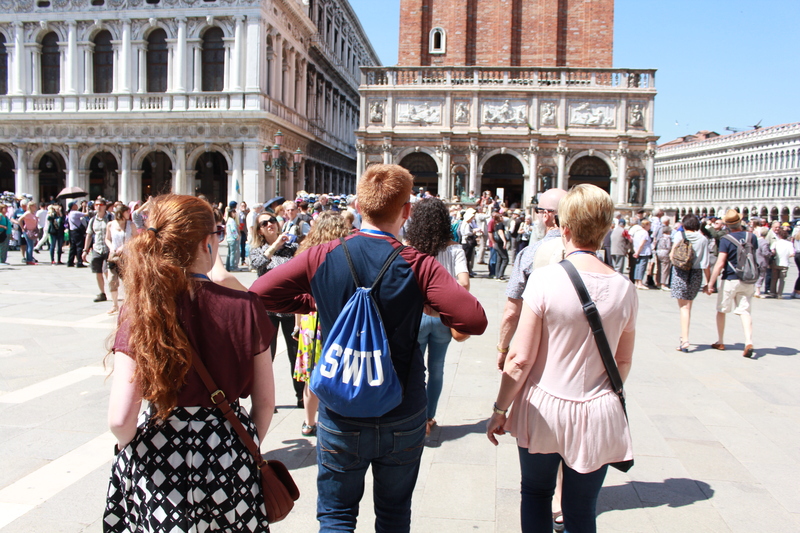 A few of the team members, Zach W., Katy, Caitlyn, Cody, Genesis, Wesley, and Zach F., were able to dance to a live orchestra in the Piazza di San Marco. When the day of touring and shopping reached its end, we hopped on the boat, returned to the bus, and started our drive to Pisa. Most of us took naps as we were exhausted from the early morning and tiring day. We arrived at our hotel in Pisa, ate supper, and prepared to go to bed. As soon as we had gotten settled in our rooms, the power went out at the hotel! It was comical to see all of us coming out of our rooms in our pajamas, wondering what had caused the outage… considering we had already had so many power issues with our sound system, it seemed only natural that we must have caused it! Power outages never happen at convenient moments! Caroline had offered to wash all the girls clothes in her bathtub. She was in the middle of that when all the lights went out with the tub full of clothes in a pitch dark bathroom. She just said “oh well” and kept washing and wringing it out till it all got done. Glad we can count on Caroline to not be deterred by anything!! One thing for sure is that you can always expect something unusual to happen to us! Going to bed tonight, we’re hoping we get the power restored so that we don’t miss our call time for the morning. We are all really looking forward to seeing how the Lord works as we sing at Camp Darby!